Thanks to Iguana Sell for lending me this pen for a review! 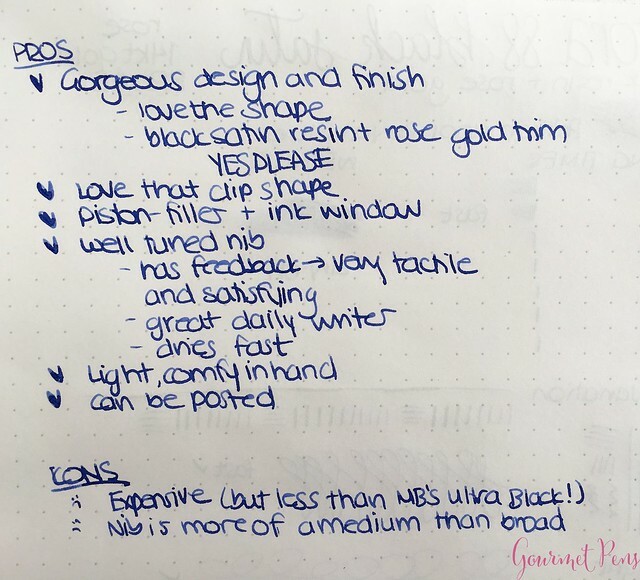 I have reviewed a different nib but it was so long ago that I figured a full review wouldn't be a bad thing. 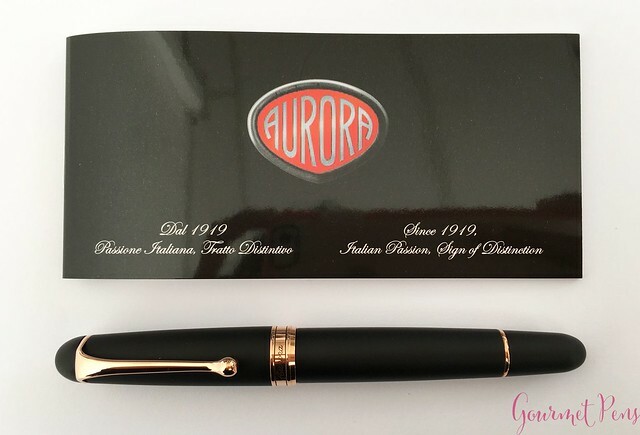 Diameter (barrel): 12.2 - 13.9 mm/0.48" - 0.54"
Diameter (section): 10.5 - 11.8 mm/0.41" - 0.46"
There is an Aurora booklet under the bed with company details/history, pen information, instructions for best use, filling ink, etc. 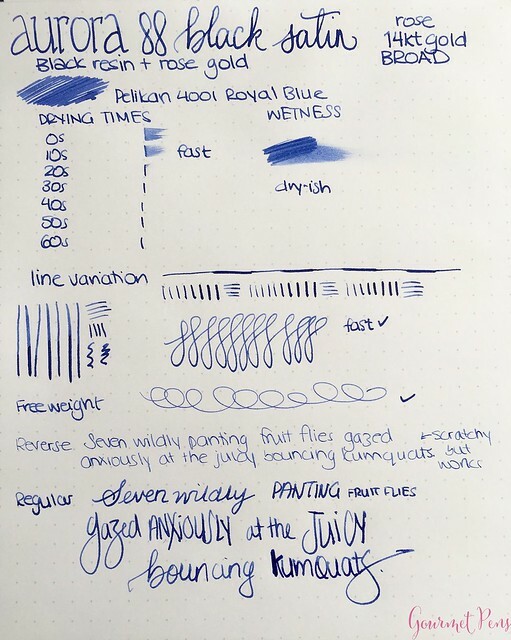 If you are new to fountain pens, this is worth reading through. There's a lot of box for this pen. This is a good looking pen that ticks all the right boxes for me. 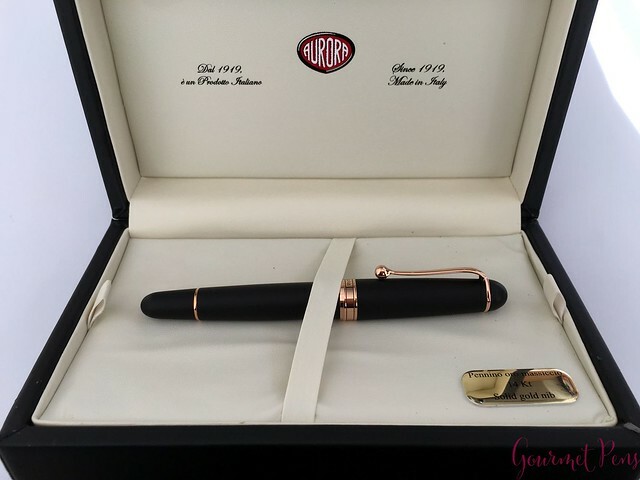 It is a regular sized pen with a cigar shape - a round body with smoothly rounded off ends. The finial is a black satin dome but it is unmarked. The clip is attached to a metal ring around the top of the cap. I love the shape of the clip! It's smooth, curvy, and ends in a teardrop. There is a center band located at the end of the cap. 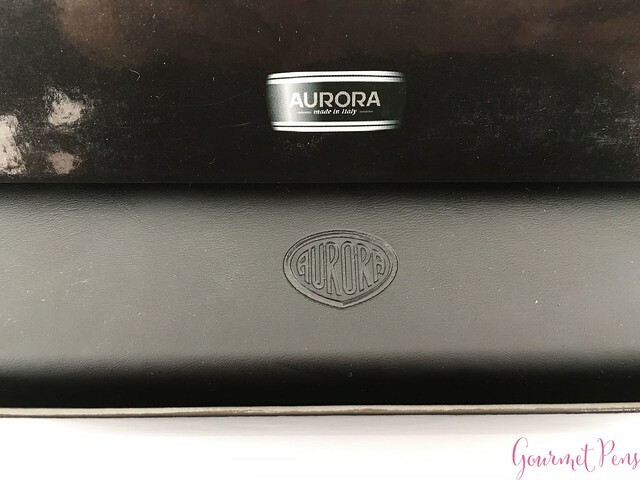 It is engraved with "Aurora" and has two thin black rings in it. It's a simple but attractive center band. There is also a thin metal band at the end of the piston-turning knob. 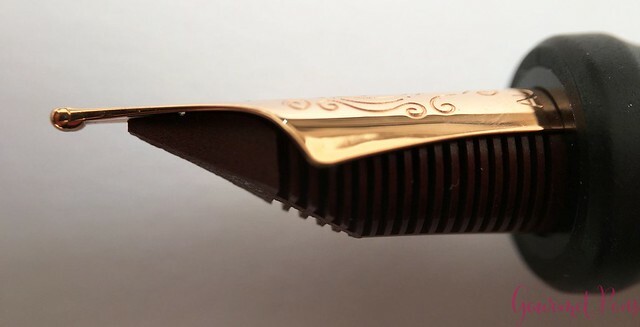 The section is fairly long, tapering slightly towards the nib and ending in a flared ridge. There are resin threads at the back of the section, and a clear, double walled ink window. 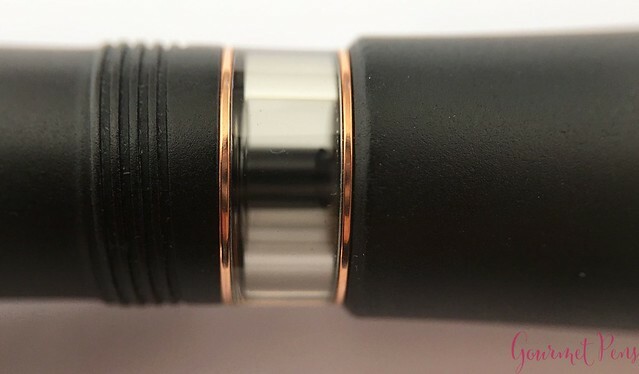 The ink window is not visible when the pen is capped, and the cap band connects smoothly with the barrel. 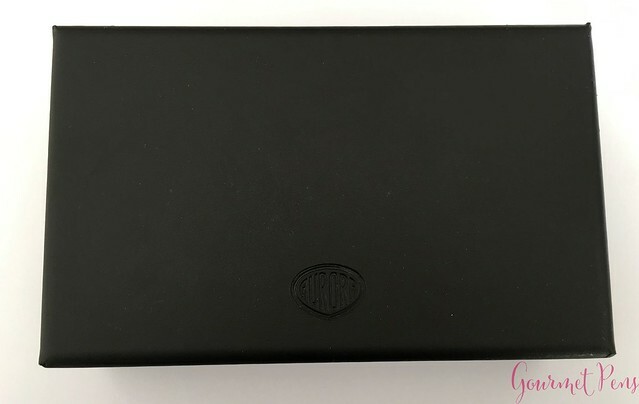 The cap, section, and barrel are all black satin resin - black with a matte finish, that is. 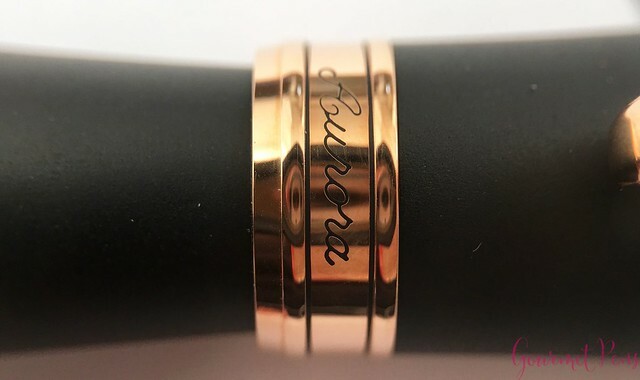 The clip, center band, and all other trim is a polished rose gold. I love the warmth of the rose gold against the matte black resin. The pen appears well finished and well made. I observed an evenly-spaced, very small gap between the finial and cap ring but that's about it. Minor detail because it looks like it was intentional. One thing I really like about this satin black finish is the material holds up really well for regular use. It doesn't pick up or show micro scratches as easily as a polished resin pen so it looks its best for a long time! 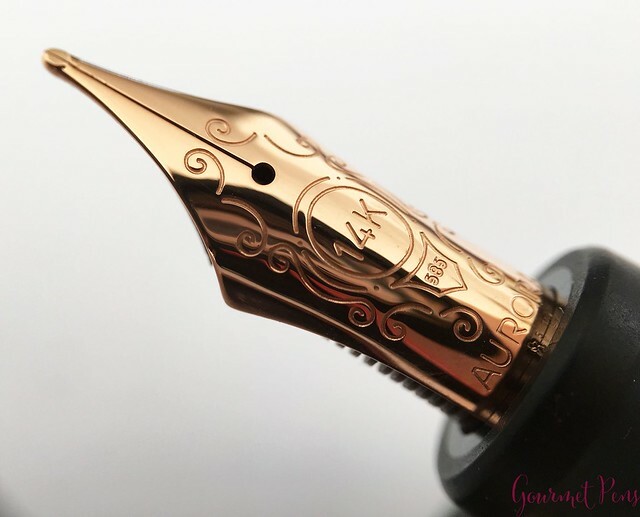 This nib is a solid 14 kt gold nib with rose gold plating, and an ebonite feed. 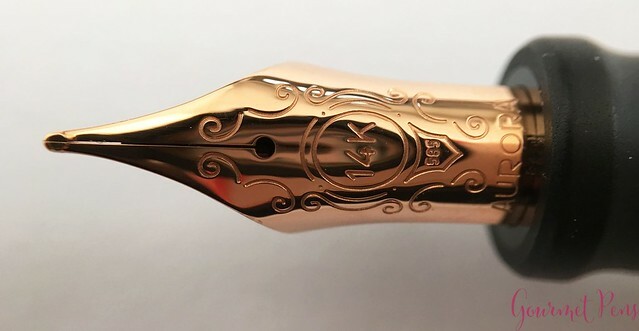 The nib has a single slit, a round breather hole, and is engraved with some flourishes, 14 K, 585, and Aurora. The feed is dark red and has a B printed on it to indicate the nib width. The clip is snug but it can be lifted. The teardrop ball at the end is angled underneath so it can be slid on and off papers, pockets, and pouches. It's tight enough to hold the pen in place as well. The piston-filling mechanism has an interesting design - a hollow piston that houses some extra ink. It's great if you run out of ink but requires some attention when you're cleaning. Unposted, the pen has a comfortable length and is on the light side. It feels well balanced. I think if you have larger hands, you'll have to post it to give it more length. 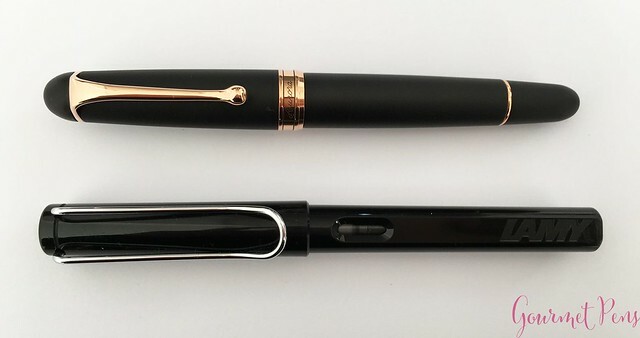 The cap can be posted snugly by friction and it gives the pen a bit more weight and length, which feels right and more comfortable for me. I love that it isn't a super heavy metal body. It's lighter and doesn't tire out my hand. Another beauty from Aurora. I'm a rose gold person - I know it's all in and trendy right now, but for me, it works. 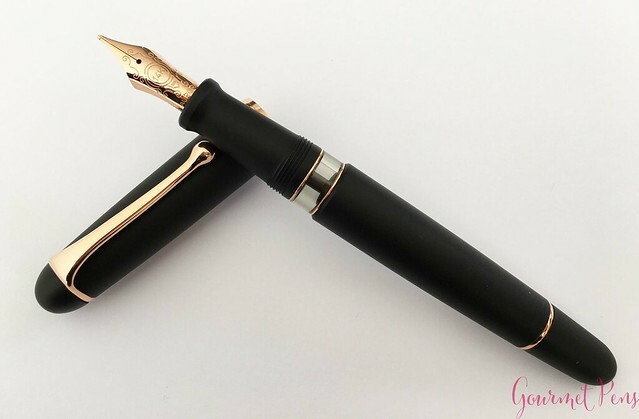 I love the black and rose gold theme and the shape of the pen is elegant and the trim is warm. I prefer the rounded ends of the 88 than the flat ends of the Optima. The nib performed well but my favorite nib remains the stub and italic. 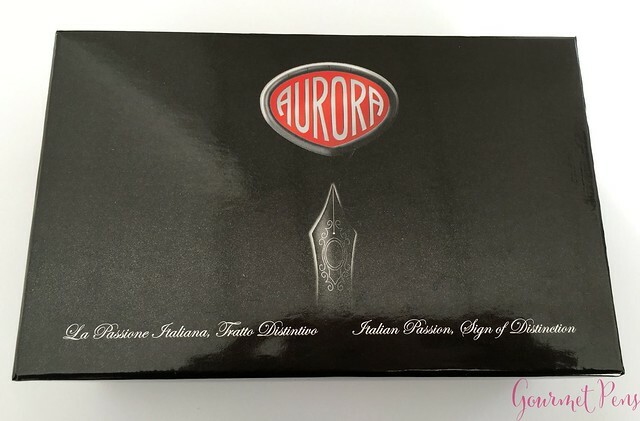 The pen is not inexpensive but I do appreciate the quality and especially that Aurora makes their own nibs in-house! I was loaned this item for the purposes of this review. I was not compensated monetarily for my review. Everything you've read here is my own opinion.